Fiber optic transmission systems (datalinks) mostly work similar to that shown below. They consist of a transmitter which takes an electrical input and converts it to an optical output from a laser diode or LED. The light from the transmitter is coupled into the fiber with a connector and is transmitted through the fiber optic cable plant. The light is ultimately coupled to a receiver where a detector converts the light into an electrical signal which is then conditioned properly for use by the receiving equipment. Just as with copper wire or radio transmission, the performance of the fiber optic data link can be determined by how well the reconverted electrical signal out of the receiver matches the input to the transmitter. Since it's easier and cheaper to run full duplex over two fibers transmitting in opposite directions, links usually consist of two transceivers connected by two fibers as shown below. Some links, like FTTH PON links do use bidirectional transmission over one fiber because they may have three signals at different wavelengths to save having to install multiple fibers. The ability of any fiber optic system to transmit data ultimately depends on the optical power at the receiver as shown below ,which shows the data link bit error rate (called "bit error rate" or BER) as a function of optical power at the receiver. Either too little or too much power will cause high bit error rates. Too much power, and the receiver amplifier saturates, too little and signal-to-noise (S/N) becomes a problem. This receiver power depends on two basic factors: how much power is launched into the fiber by the transmitter and how much is lost by attenuation in the optical fiber cable that connects the transmitter and receiver. The link loss budget is the difference between the transmitter output and the receiver input and is an important calculation made during the design phase of any system. When testing, since typically both transmitters and receivers have receptacles for fiber optic connectors, measuring the power of a transmitter is done by attaching a test cable to the source and measuring the power at the other end. For receivers, one disconnects the cable attached to the receiver receptacle and measures the output with the meter. That measured value must be within the specified loss budget of the link. Datalinks can be either analog or digital in nature. Both have some common critical parameters and some major differences. For both, the optical loss margin is most important. This is determined by connecting the link up with an adjustable attenuator in the cable plant and varying the loss until one can generate the curve shown below. Analog datalinks will be tested for signal to noise ratio to determine link margin, while digital links use bit error rate as a measure of performance. Both links require testing over the full bandwidth specified for operation, but most data links are now specified for a specific network application, like AM CATV or RGB color monitors for analog links and SONET, Ethernet or Fibre Channel for digital links. The optical power margin of the link is determined by two factors, the sensitivity of the receiver, which is determined in the bit error rate curve above and the output power of the transmitter into the fiber. 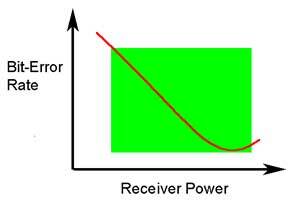 The minimum power level that produces an acceptable bit error rate determines the sensitivity the receiver. The power from the transmitter coupled into the optical fiber determines the transmitted power. The difference between these two power levels determines the loss margin of the link. If the link is designed to operate at differing bit rates, it is necessary to generate the performance curve for each bit-rate. Since the total power in the signal is a function of pulse width and pulse width will vary with bit-rate (higher bit-rates means shorter pulses), the receiver sensitivity will degrade at higher bit-rates. Every manufacturer of datalinks components and systems specifies them for receiver sensitivity (perhaps a minimum power required) and minimum power coupled into the fiber from the source. Typical values for these parameters are shown in the table below. In order to test them properly, it is necessary to know the test conditions. For data link components, it includes input frequency or bitrate and duty cycle, power supply voltages and the type of fiber coupled to the source. For systems, it will be the diagnostic program needed by the system. Multimode systems operating at gigabit rates and above will have derating factors for the bandwidth of the optical fiber being used. Within the datacommunications links and networks, there are many vendor proprietary fiber optic systems, but there are also a number of industry standard networks. These networks have agreed upon specifications common to all manufacturers' products to insure interoperability. The FOA Guide has a page that shows a summary of many these systems. Once you have a transmitter output power and receive input requirements, you can calculate a link loss budget. This will tell you how much loss the network equipment can tolerate and if the cable plant designed for this equipment will transmit the signals without error. Here is a FOA Tech topics page on Link Loss Budgets. Testing a fiber optic network is straightforward using a fiber optic power meter and some good patchcords. However, fiber optic networks should only be tested when initially setting up the system or troubleshooting network transmission problems. Otherwise, lock up the connections and leave them alone! Fiber optic networks are much more reliable than other transmission methods and do not need periodic maintenance. Fiber optic connectors and cables should be handled with care. While they are not delicate, they can be damaged by improper handling. Do not bend cables too tightly, especially near the connectors, as sharp bends can break the fibers. Do not drop the connectors, especially if they do not have a dust cap on the ferrule, as they can be damaged by a blow to the optical face. Do not pull hard on the cable attached to the connector, as this may break the fiber in the backshell of the connector or cause pistoning if the bond between the fiber and the connector ferrule is broken. If there is any question about the condition of the connectors, clean them before testing. A fiber optic inspection microscope with appropriate stages to hold the connectors should be used to verify the condition of the connectors if there is any doubt about their cleanliness or physical condition. Fiber optic networks are always specified to operate over a range of loss, typically called the system margin. Either too much loss or too little loss can be a problem. If the loss is too high, the signal will be low at the receiver, causing a poor signal to noise condition in the receiver. If the loss is too low, the power level at the receiver will be too high, causing receiver saturation. Both these conditions will cause high bit error rates in digital systems or poor analog signal-to-noise (S/N) performance. The installed fiber optic network can be tested quickly and easily with a fiber optic power meter. The network transmitter needs to be set to transmit a test signal, a clock output or other bit stream of known duty cycle. Set the power meter calibration on the proper wavelength and the reading units on dBm. To test the received power at the far end of the link, the most critical element in the network, merely disconnect the fiber optic cable connector at the receiver, attach the power meter, and measure the power. If the receiver power is low, the transmitter power should be measured by disconnecting the source jumper cable at the first available connector and measuring the power with the fiber at that point. Alternatively, one can disconnect the cable at the transmitter and use a known good test jumper to measure the coupled power. If the output is measured through a short network jumper cable ( less than 10 meters ), no compensation for jumper loss is necessary. For longer jumpers, some compensation may be necessary. If receiver power is low, but transmitter power is high, there is something wrong with the cables. They must be tested at every connection to isolate the bad cable(s) and or connectors (see below.) This can be done from either end with a power meter and source or, if the cable plant is sufficiently long, an OTDR. Starting from the transmitter or receiver end, follow the network cables to every patch panel. Disconnect the connector and measure the power at each point. By making measurements in dB, one can easily calculate the loss of the cable network to each point by subtracting successive readings. When a suspect cable is found, by noting a larger than expected loss in the cable link, the suspect cable needs testing by the appropriate method described above. If a cable has attenuation that is higher than specifications, but still transmits light, check connectors on a microscope to determine if they have been damaged and should be replaced. If the connectors look good, the best solution may be to replace the cable or switch to a spare. If a visual fault locator is available, it can be used to visually locate breaks in the fiber and find broken connectors. Under some circumstances, such as high loss in long jumper or trunk cables, an OTDR (optical time domain reflectometer) can be used to diagnose cable faults. Test the complete cable plant, including all individual jumper or trunk cables, for loss, using a power meter and source and the double-ended method described above in the chapter on testing the cable plant. Use the OFSTP-14 (double-ended) method, since system margin specifications include the loss of connectors on both ends of the fiber. If the end-to-end (transmitter to receiver) loss measurement for a given fiber is within the network margin specification, the data should be recorded for future reference. If the loss is too low, notation should be made that that fiber will probably need an inline attenuator to reduce receiver power to acceptable levels. If the loss is too high, it will be necessary to retest each link of the complete cable run to find the bad link. Possible causes of high end-to-end link loss are bad connectors, bad splice bushings in patch panels, cables bent too tightly around corners, broken fibers in cables or even bad launch or receive cables or instruments. There are only two ways to find the problem: test each segment of the cable individually to find the problem or and OTDR ,if the lengths are long enough for viewing with the limited resolution of the OTDR. Do not use an OTDR for measuring end to end loss; use it for troubleshooting problems. It will not accurately measure actual link loss as seen by the actual transmitters and receivers of the fiber optic link. As normally used, the OTDR will not count the end connectors' loss. The OTDR uses a laser which has very restricted mode power distribution, which minimizes the loss of the fiber and the intermediate connectors. Finally, the difference in backscattering coefficients of various fibers leads to imprecise connector loss measurements. See OTDRs. The datacom capabilities of the network can be tested with a loopback test . This test uses a calibrated fiber optic attenuator which has either a fixed or variable dB loss placed between the transmitter and receiver on a piece of equipment to see if it can transmit data to itself. Many types of network equipment have diagnostics to do loopback testing. This will test the transmitter and receiver of the unit under standard data transmission conditions over the specified link loss budget. Some equipment can also institute an electrical network loopback test, where the loopback path is all electronic inside the equipment, looping back over the entire datalink to the equipment on the far end of the link. If both ends of the link pass a unit loopback test but fail a network loopback test, the problem is in the cables, which then need testing by the methods described above. More on fiber optic data links.